Scotland's finance secretary has assured the country's businesses that his forthcoming budget will prioritise "growth and innovation". 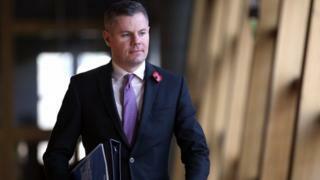 Derek Mackay will outline his tax and spending plans for next year when he unveils his draft budget on Thursday. It is widely expected that his proposals will increase income tax for middle and high earners. But business leaders have warned him that doing so could cause economic damage that would take years to fix. Mr Mackay has come under pressure from Scottish Labour, the Greens and Liberal Democrats - as well as many SNP members - to use his powers over income tax rates and bands to raise more money for public services. In a statement released on Sunday, Mr Mackay made no mention of his tax plans - but pledged that the government would "continue to protect public services" in its budget. He said the Scottish government's vision was for a "future-proofed, forward thinking Scottish economy" and that his plans would help to realise that vision. And he said his budget would aim to "unlock economic potential" in the country's manufacturing, innovation, digital connectivity, infrastructure and housing sectors. Mr Mackay added: "Our ambition to create an economy that works for Scotland will be driven by investment in infrastructure, capital, research and in our people. "We are proud of our entrepreneurs and appreciate that the risks they take in order to innovate, require investment. "This budget will meet those needs by delivering on key commitments to support research and development, to give Scottish companies a competitive edge in manufacturing processes through the establishment of the National Manufacturing Institute for Scotland and to reform business rates." Mr Mackay also said his budget would bring forward plans to improve the country's broadband connections, which he said were "vital to the economic and social wellbeing of rural communities". What might Mr Mackay announce on income tax? The Scottish government published an options paper on income tax last month, with First Minister Nicola Sturgeon saying the country "must consider if the time has come for those who earn the most to pay a modest amount more". Three of the four approaches outlined in the paper would see people earning more than £24,000 pay more income tax - and all four would increase tax for those earning more than £44,290. The various proposals, some of which would see additional tax bands created, were predicted to raise between £80m and £290m depending on which one was ultimately adopted. The latter figure would more than match the £219m real-terms reduction in the UK government's block grant to Scotland which has been estimated for next year by economists at the Fraser of Allander Institute. BBC Scotland political editor Brian Taylor has said he believes Mr Mackay is likely to announce an increase in the additional rate for those on the very highest earnings. And he has predicted that an extra tax band could be created which would see those who are above the median salary of £24,000 also pay a bit more. What have other other people had to say? Last week, the head of Scotland's largest business organisation - the Scottish Chambers of Commerce - warned that Scotland "cannot afford to be associated with higher taxes than elsewhere in the UK". Speaking at a dinner attended by Ms Sturgeon, Tim Allan also said that a "high-tax Scotland would be easy to achieve but the damage could take years to repair". And he called for a "level playing field on tax throughout the UK to keep Scotland competitive". His views echoed those of the Scottish Conservatives, who have warned that "tax hikes would be a disaster not just for hard workers, but businesses right across the country". But Ms Sturgeon told the dinner: "The needs of business are too often seen as separate from, or competing with, the goal of building a fairer society - the reality is that the two can be mutually supportive, and that is something our budget will seek to reinforce." Scottish Labour leader Richard Leonard has warned that a "radical change of direction" on taxation is needed in order to raise the money needed to save the country's public services from "unsustainable cuts". Mr Leonard urged Mr Mackay to "stop Tory austerity, not just tinker round the edges", and warned that the challenges facing public services are "huge". He added: "Local councils are bracing themselves for an effective cut of over £800m. The human cost of that would be devastating. It would mean an end to breakfast clubs, cutting childcare to the bone and axing support for disabled children." Scottish Green's co-convener Patrick Harvie, whose party's support may be needed for the minority government to pass the budget, said no deal had been done. He said one of the things he would be looking for was a significant pay increase for public sector workers. He told the BBC's Sunday Politics Scotland programme: "We've said we want to see an inflation based - as minimum - pay increase in the public sector. Protect local government services that have been cut over many, many years.... and we can do that with fairer taxation." Scottish Liberal Democrat leader Willie Rennie called on Mr Mackay to deliver "transformative investment" in education. He said: "We want to invest £500m in education. We think there should be an investment in colleges, schools and nurseries and we'd do that by putting a penny on the basic rate of income tax."